Ben Henderson, who goes to Arizona State University (studying philosophy) and is a second year mellophone player for the Academy, sent in this one. Incidentally, Ben also marched with the Corona del Sol High School marching band on both trumpet and mellophone. He also helps out at Higley High School with their band program. 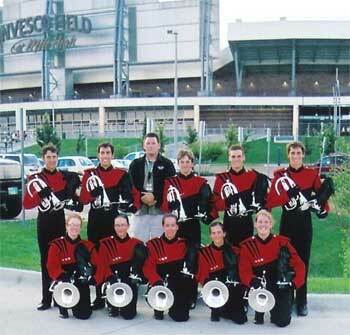 "This is a picture of the 2005 Academy mellophone section at our last show in Denver. The boys in the back row, from left to right, are me, Gabe, our instructor Tom Fay, Patrick, Mike and Ben J. The girls, from left to right, are Alexis, Ingrid, Erin, Kristen and Janessa. The season, although short, was absolutely unforgettable, and besides learning volumes about music and marching from Tom, we learned even more about friendship and dedication. Thank you all for making the season absolutely awesome!" Thanks Ben! E-mail your best shots from the summer to dave@dci.org along with where and when the photo was taken. Send some biographical information about yourself as well. We'll give you full credit. Also, let us know if you want your e-mail address included.